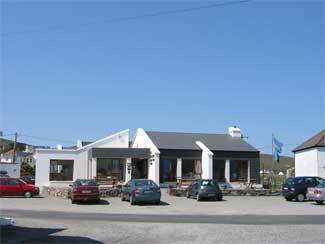 At their informal restaurant and attractive craft shop in Keel, husband and wife team Michael and Patricia Joyce take pride in the careful preparation and presentation of the best of Achill produce, especially local seafood. Since opening, in 1991, they have extended both the menu and the premises more than once and now offer great all-day self-service food, which you can have indoors, or take out to a patio overlooking Keel beach. Everything is home-made, including delicious soups such as seafood chowder and traditional nettle soup (brotchán neantog) all served with home-made brown scones. As baking is a speciality, there’s always a tempting selection of cakes, bracks, teabreads, fruit tarts, baked desserts and scones with home-made preserves or you can simply have a toasted sandwich, or an Irish farmhouse cheese plate. You may want to allow a little extra time here as the shop is interesting, with quality gift items and clothing lines not found elsewhere. The restaurant is now fully licensed and the Joyces are considering extending the opening hours to develop an evening restaurant in the not too distant future - details on inquiry. Situated in the centre of Keel village overlooking beach and Minuan cliffs.